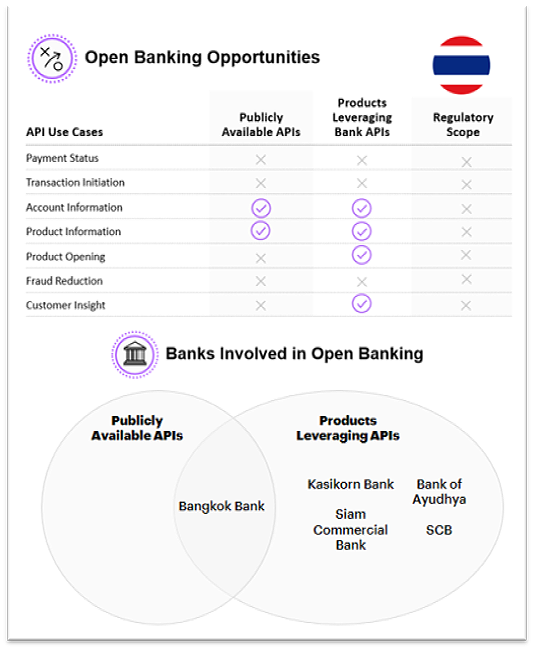 There has been very little regulatory conversation about Open Banking in Thailand and to date, regulators have not initiated any frameworks or regulation on the issue. That said, Thailand wishes to become a value-based economy and sees tremendous potential from fintech and improved digital services. This ambition was encapsulated in the “Thailand 4.0” initiative, launched by the government in December 2015, and has been backed up by measures taken by regulatory and supervisory bodies in the years since. E-payment regulation aims to boost fintech innovation by providing a framework for how e-money and electronic payment services are provided, while regulators have promoted the use of APIs by releasing their own. In December 2016, for instance, the Bank of Thailand (BOT, the central bank) launched a regulatory sandbox for products related to loans, payments and fund transfers. In March 2017 the Office of Insurance Commission announced intentions to launch an insurtech sandbox, allowing agents, insurers and fintech companies to test innovative products. In October that year, the BOT announced e-payment regulation that aims to facilitate innovative payment schemes and a cashless economy. Thailand’s Securities and Exchange Commission (SEC) has also taken two initiatives: in June 2017 it launched a series of sandboxes for securities, derivatives, clearing houses, know-your-customer initiatives and e-trading. And in January 2018 it launched an API portal for financial product information, exchange rates and more. Several market players have taken the initiative to develop e-payment and Open Banking-related services, in tandem with the government’s push to encourage innovation. In December 2016, for instance, Kasikorn Bank released their K-Payment Gateway, allowing SMEs to accept and process payments. In May 2018 Kasikorn Bank also showcased their QR API system, which allows customers to transfer funds between other banks. Bangkok Bank has taken several ground-breaking steps: It was the first in the country to launch a developer portal—in January 2017. The portal had just four APIs but paved the way for other banks in the country to develop similar platforms to encourage innovation. In May 2017 Bangkok Bank also launched a 12-week fintech InnoHub program, partnering with Nest and 8 early-stage fintechs. Meanwhile, in May 2018, Siam Commercial Bank launched a partnership with social media group Line Thailand to allow corporate users to receive notifications of deposits, withdrawals and card spending. In August 2018 SCB also announced a partnership with The Mall Group to launch co-branded cards, QR payments, banking services and parking reservation services. The SCB and Mall Group partnership has resulted in a multitude of new products that leverage SCB’s APIs. Another key initiative is Bank of Ayudhya’s Krungsri Mortgage Loans app, announced in June 2018, which will be available through social media, Line and property search portals, giving customers visibility into mortgage affordability. While these examples demonstrate local players’ wish to innovate, the opportunity to leverage innovative ideas outside payments remains largely unexplored. As ASEAN’s second largest economy, Thailand risks falling behind regional powerhouses. Bangkok Bank’s developer portal, for instance, while innovative, remains some way behind those of regional leaders. Competition on the payments space from regional giants like Paytm, WeChat and Alipay could disrupt Thai banks and fintechs, while larger regional banks with established developer portals could steal digital customer market share. Thailand’s banks now have the opportunity to establish API standardisation before developing their capabilities. In particular, they should continue to partner with third party providers—as SCB has with The Mall Group—to create ecosystems on which a broader range of innovative products can be developed. API standardisation and adoption in Thailand will be difficult to achieve without TPPs and banks focusing on building larger interconnect ecosystems. TPPs and Thai banks would benefit from having regional Open Banking support organisations such as the ASEAN Fintech Innovation Network (AFIN) to help standardise banking and data infrastructure. AFIN has worked with industry and regulators, TPPs and banks in other jurisdictions (Singapore, Malaysia, Indonesia, etc.) by providing a sandbox for the three parties to collaborate. There is an opportunity to apply this same framework in Thailand, thereby facilitating API standardisation and ecosystem collaboration. This article was written in collaboration with Ewa Wojcik, Sam Waldman, and Hakan Eroglu. Many thanks for their input, research and analysis.